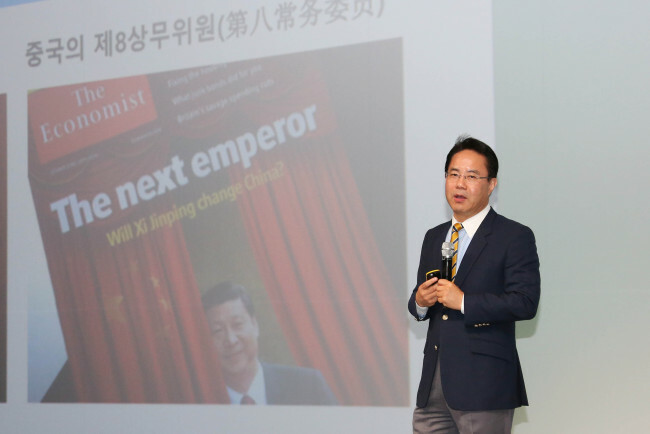 SEOGWIPO, Jeju -- The nature of the ongoing trade war between the US and China is in Washington’s ambition to open Beijing’s financial market, a Korean expert on China’s economy said Friday. China’s strengths in the manufacturing sector are too much even for the US, but it has its weakness in financial industry and Trump is targeting that, according to Jeon Byung-seo, head of Institute for China Economy and Finance. “The fundamental motive of the bilateral trade war is to push China to open its financial market and make money by becoming the first in the market before it becomes mature,” Jeon said in his lecture held at a forum hosted by the Korea Chamber of Commerce and Industry. Chinese President Xi Jinping, for his part, is less likely to take an immediate action against US President Donald Trump, who is raising stakes in the unprecedented trade war between the two super powers. Earlier this month, the Trump administration said it would slap 10 percent tariffs on an extra $200 billion worth of Chinese imports. “Xi will wait until the election campaign begins, when Trump’s leadership will be tested at the congressional midterm election (in November),” he said. Manufacturing is no longer the driving force of the Chinese economy, as the growth of the service industry has already surpassed the nation’s traditional industrial sector, Jeon said. And middle-class Chinese are going to spend more on automobiles, finance and welfare. The demographic change and transition of industries in China has implications for South Korea, he said, adding that Asia’s fourth-largest economy should closely watch the neighboring country asit becomes part of the global financial market, rather than focusing on ways to beat them in manufacturing. “Korea should acquire shares in Chinese companies that went ahead of us. Take a long shot, if competition in manufacturing sector does not work, be prepared for (China) opening its window to its financial market,” he said referring to China’s innovative companies including Baidu and Tencent.